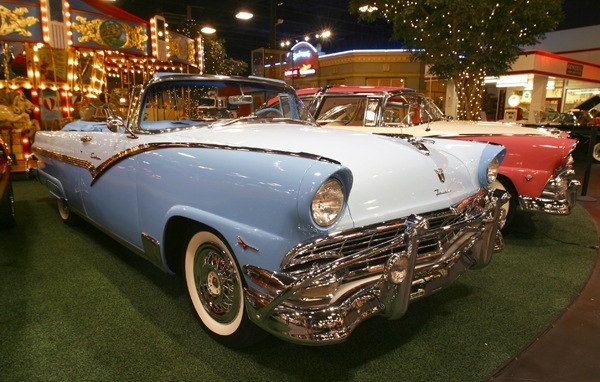 The Ford line of cars gained a new body for 1955 to keep up with surging Chevrolet, although it remained similar to the 1952 Ford underneath. 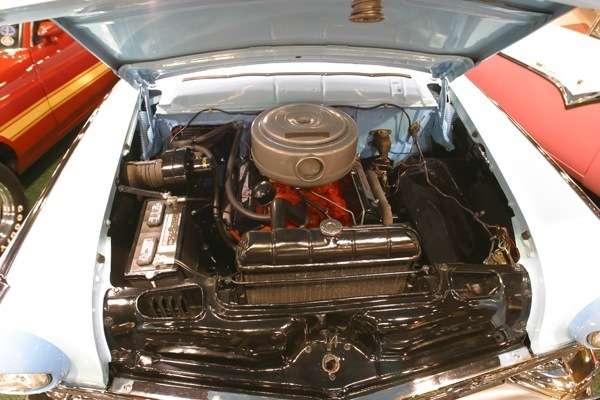 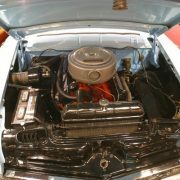 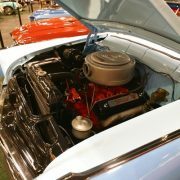 The Mileage Maker straight-6 was bumped up to 223 CID (3.7 L) for 120 hp (89 kW) and the new-for-1954 Y-block V8 was now offered in two sizes: Standard Fords used a 272 CID (4.5 L) version with 162 hp (121 kW), but the large 292 CID (4.8 L) unit from the Thunderbird was also offered, boasting 193 hp (144 kW). 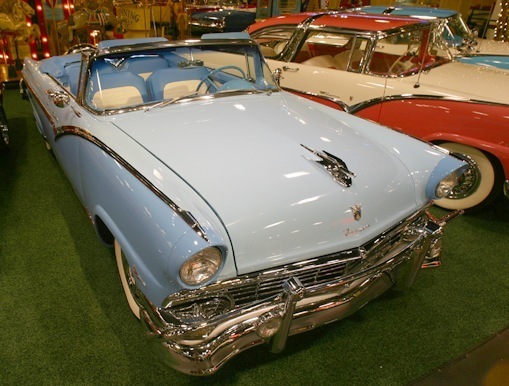 Apart from the engine changes, customers were sure to notice the new “Fairlane”, which replaced the Crestline as the top trim level, while a new “Crown Victoria” style featured a chrome “basket handle” across the familiar (and continued) “Victoria” hardtop roof. 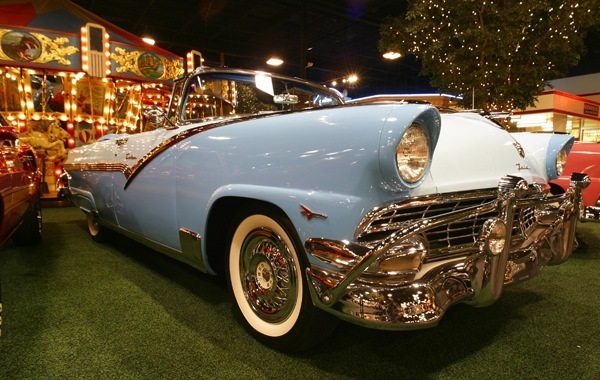 The company now boasted three different rooflines, the tall two-pillar Mainline, Customline, and Fairlane, lower chrome-pillar Crown Victoria, and pillarless hardtop Victoria. 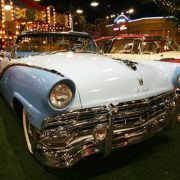 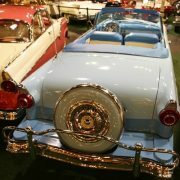 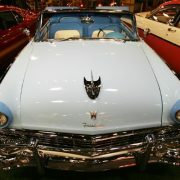 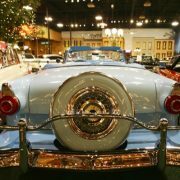 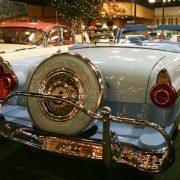 The “Skyliner” acrylic glass roof was still offered, this time only on the Crown Victoria model. 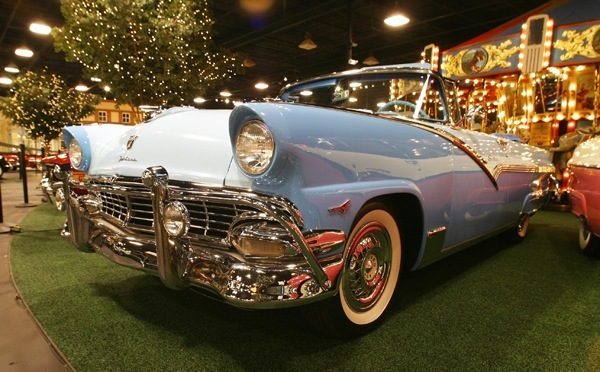 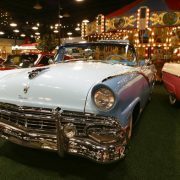 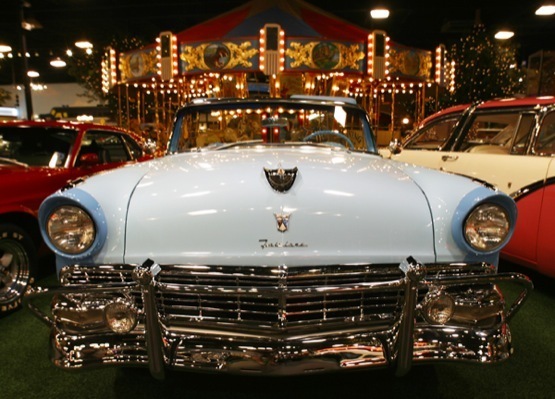 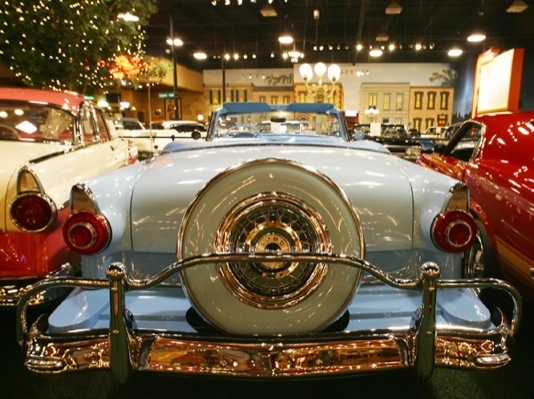 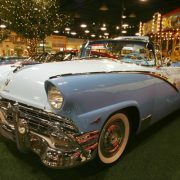 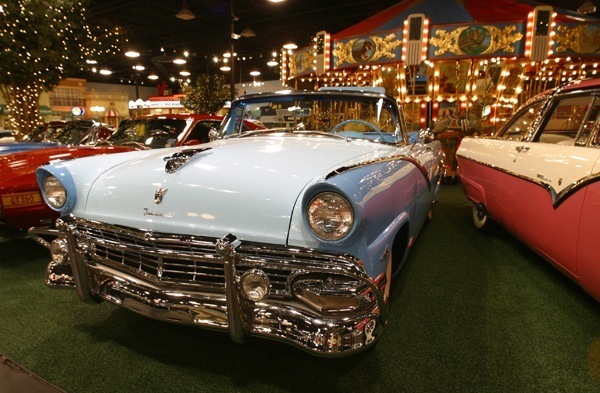 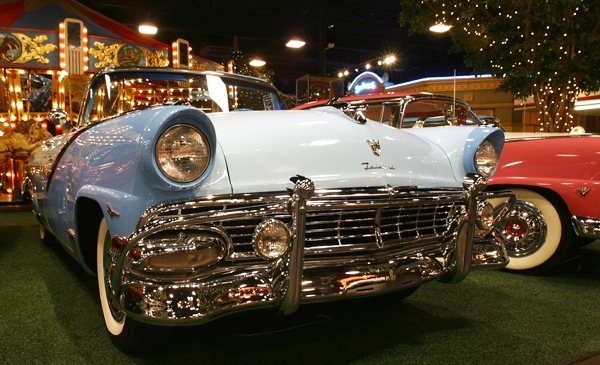 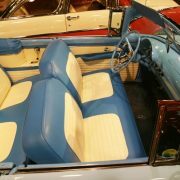 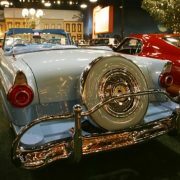 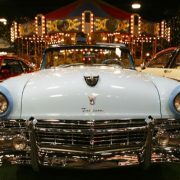 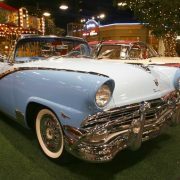 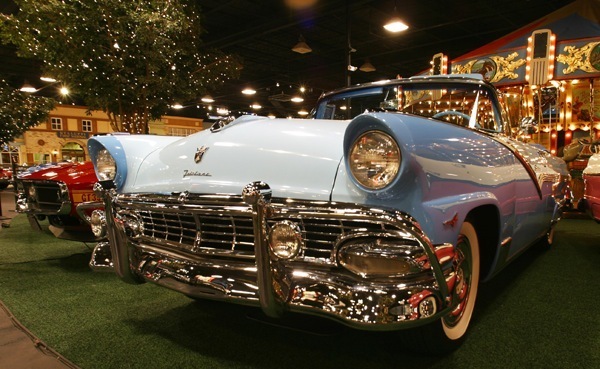 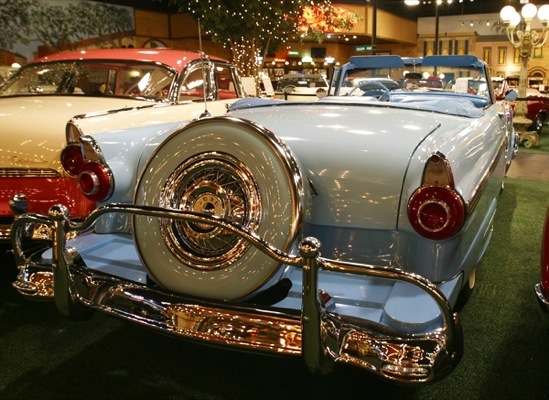 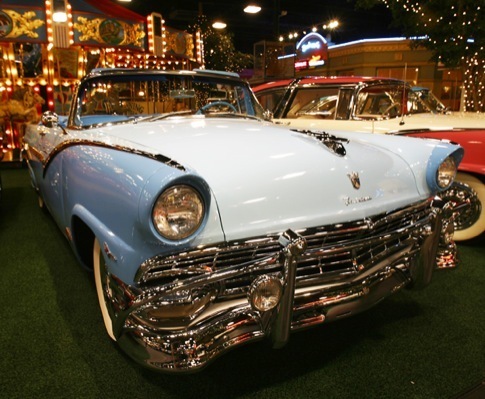 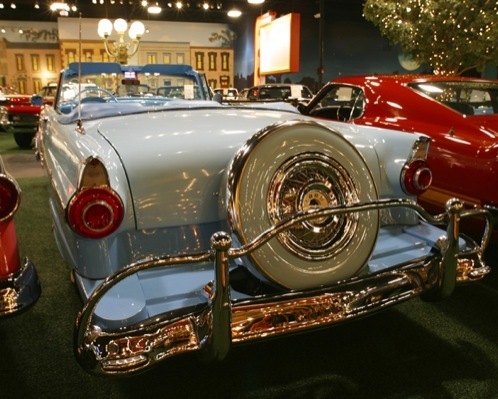 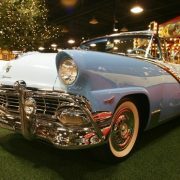 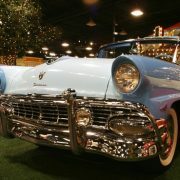 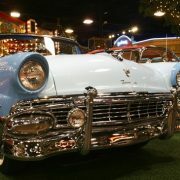 The Fords introduced for 1955 also featured the panoramic windshields found on Buicks, Oldsmobiles and Cadillacs the previous year. 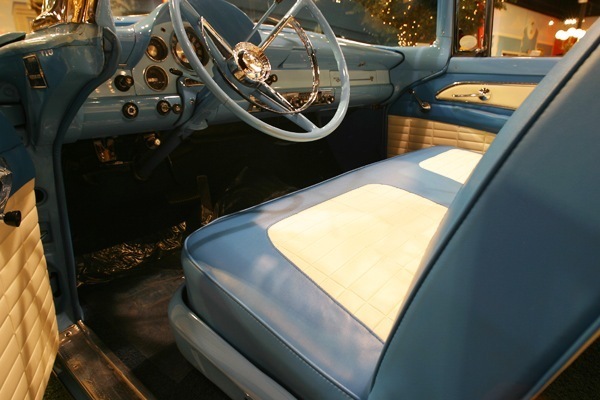 With this panoramic windshield the A-pillars have a vertical angle. 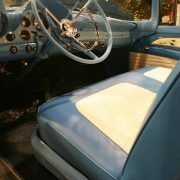 this gives the driver more panoramic visibility. 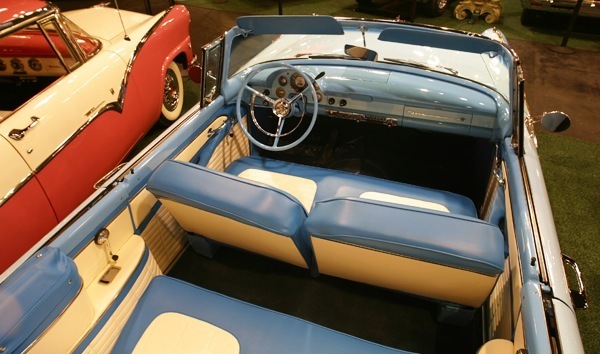 For the first time, Ford offered seat belts as an option. 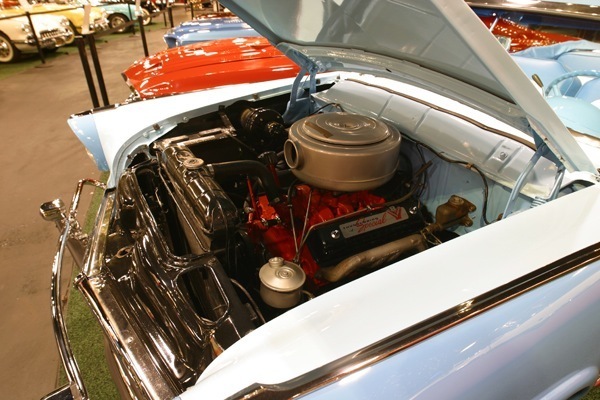 Also new for 1955 was Ford’s first factory installed air conditioner. 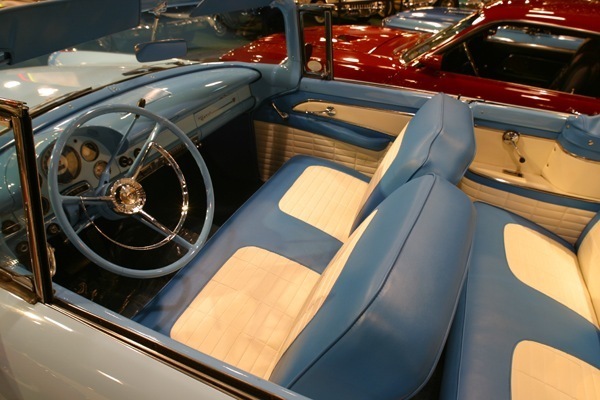 This “Select Aire” option featured an integrated heater core and evaporator coil unit within the dash and cold air discharge vents located on top of the dash on either side of the radio speaker. 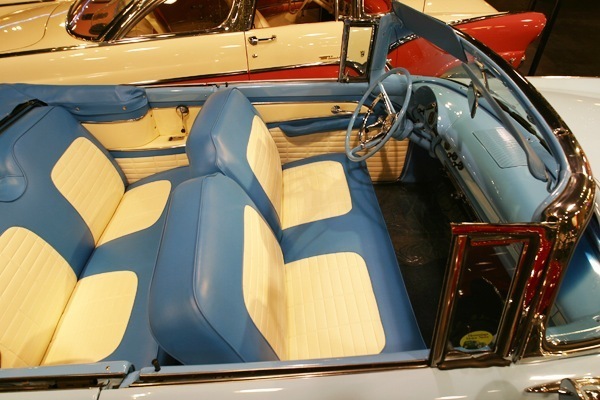 The “Select Aire” design was carried over to the 1956 models with slightly different cold air vents in the same location as on the 1955 models. 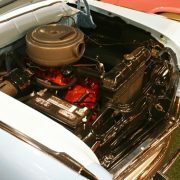 The condenser was mounted in front of the radiator as in later cars. 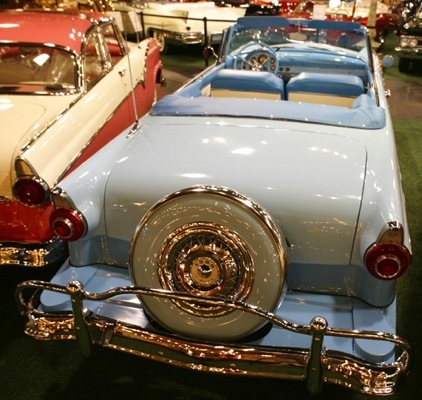 Station wagons were offered as a separate series for the first time in 1955. 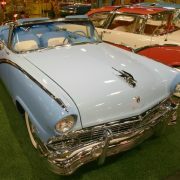 The Ranch Wagon and Custom Ranch Wagon were 2 door wagons whilst the Country Sedan and Country Squire models were 4 doors wagons, the latter featuring wooden appliqué side mouldings. 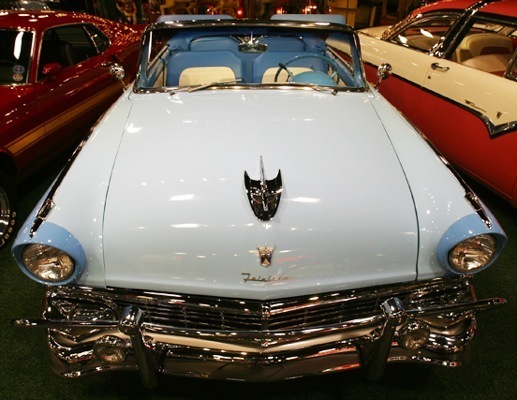 1956 Ford Fairlane Crown VictoriaThe eggcrate grille featured on the 1955 cars was widened into a series of rectangles for 1956, but this subtle exterior change was nothing compared to Ford’s adoption of a 12-volt electrical system across the line. 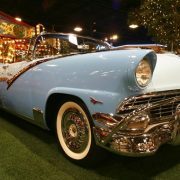 The Crown Victoria Skyliner’s sales were plummeting with just 603 made, and it would be replaced by a convertible the next year. 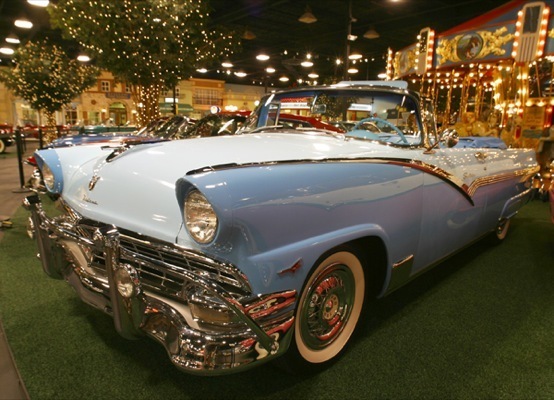 A new addition at midyear was the “Town Victoria” 4-door hardtop model which, along with the new Customline 2-door hardtop, were meant to compete with the Chevrolet Bel Air. 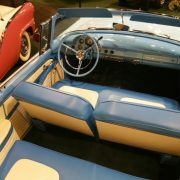 The Lifeguard safety package — consisting of seat belts, a padded dashboard and a breakaway rearview mirror — was introduced. 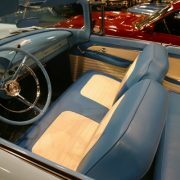 The option was a slow-seller. 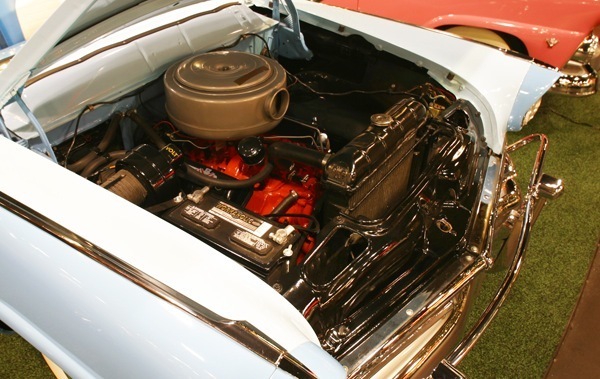 The optional air conditioner, which remained expensive and thus a slow seller, was totally revamped; the compressor was now housed beneath the hood and the cooling vents were moved to atop the dashboard.